NORTH CHARLESTON, SC (March 6, 2019) – Today, the Charleston Area Regional Transportation Authority (CARTA) broke ground on a new four-acre Rivers Avenue park-and-ride lot in North Charleston. The lot, technically located on Melnick Drive next to Texas Roadhouse, will feature 289 parking spaces, bathrooms, and bike racks. It will be fenced, lighted and monitored by cameras. It’s the first dedicated lot owned by the transit authority and the Berkeley-Charleston-Dorchester Council of Governments, which has managed CARTA since 2015. The current park-and-ride area, in a nearby shared lot, hosts hundreds of commuter vehicles daily. The bulk of passengers are MUSC and College of Charleston employees and students, in addition to other riders who work on the peninsula. The lot is served by CARTA routes Express 1, Route 10 – the system’s busiest route – and Route 12 Upper Dorchester/Ashley Phosphate Road. TriCounty Link routes Commuter Solutions 1, Commuter Solutions 2 and B102 also service the lot. Seekings also noted that the lot is available to carpool and vanpool riders. There is no cost to park. The Rivers Avenue park-and-ride launched in 2007 and is the busiest of the system’s seven park-and-ride locations, which include two shared lots in Mount Pleasant, Summerville, West Ashley, James Island and another in North Charleston at Festival Centre. “North Charleston is often on the forefront of transit and transportation in the region, and we’re happy to be home to the region’s first dedicated park-and-ride facility,” said North Charleston Mayor Keith Summey at today’s groundbreaking. BCDCOG recently concluded a regional park-and-ride study that identified and conceptualized 22 new or “enhanced” permanent park-and-ride sites as part of the 10-year-plan. CHARLESTON, S.C. (Feb. 19, 2019) – Today, the Charleston Regional Transportation Authority (CARTA) cut the ribbon on a new solar-powered shelter at the corner of Dorchester Road and Purcell Drive in North Charleston. The event marked the final installation in the first stage of a large-scale shelter and bench project for the transit system. Funding for eight shelters and 12 benches along the Dorchester and Ashley Phosphate Road corridors was made available via a $100,000 allocation facilitated by CARTA board member and former North Charleston City Councilmember Ed Astle when he still served on Council. CARTA staff leveraged the funds to obtain federal grants. “This area has long needed additional transit amenities, and I’m happy to play an instrumental role, along with CARTA staff, in helping to make that happen,” Astle said. The perforated steel shelters are equipped with solar batteries that keep them illuminated at night. Their design allows for airflow on hot Lowcountry days. CARTA will continue with installations throughout its service area. More than 60 shelters and 40 benches will be installed as part of the program. The Charleston Area Regional Transportation Authority (CARTA) will provide free transportation this evening, Wednesday, Dec. 5, to the Charleston County warming shelter located at the 3765 Leeds Ave. in North Charleston. Those seeking shelter in downtown Charleston should wait at a Route 10 Rivers Avenue or Route 11 Dorchester Road/Airport bus stop and inform the driver that they wish to travel to the shelter. Passengers will be transported to the North Charleston SuperStop at Rivers and Cosgrove avenues, where they will transfer to Route 103 Leeds Avenue, which serves the warming shelter located in the Coastal Pre-Release Center. 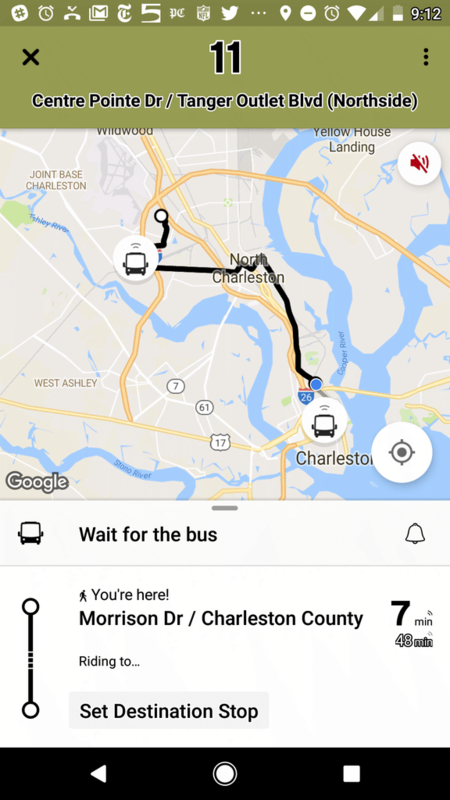 In North Charleston, riders seeking shelter should let drivers know their desired destination when boarding in order to be transported to the shelter. The purpose of this Request for Proposals is to purchase and install a well proven, industry standard, integrated package of public transit ITS hardware and software intended to assist dispatch and communications, capture data for transit system planning and management analysis, facilitate enhanced safety and security and provide enhanced public information. Ridership on the Charleston Area Regional Transportation Authority’s Hospitality on Peninsula (HOP) Shuttle surpassed 10,000 in July, the third-straight record-setting month for the pilot park-and-ride program. The park-and-ride program is the first of its kind on the peninsula and was brought to fruition via a collaborative partnership between the City of Charleston, Charleston County, the Charleston Area Convention and Visitors Bureau and the Berkeley-Charleston-Dorchester Council of Governments. Total ridership on the HOP in July was 10,015. Service is currently scheduled for about every 15 minutes between 6 a.m. and 3 a.m., seven days per week. Visitors to downtown Charleston and all commuters are encouraged to park all day for just $5 and ride the HOP shuttle for free. Seekings noted that the HOP will be a convenient option for College of Charleston students who live off the peninsula and drive downtown. Riders can track buses in real-time on the Transit app available on iPhone and Android. transit study, with Phase I to focus on the public transportation needs and desires of residents and businesses. An online survey is available through Aug. 17 here (https://surveymonkey.com/r/mtptransit). Paper copies of the survey are available at Mount Pleasant Town Hall. A public open house will be held Tuesday, Aug. 7 from 3 – 7 p.m. in the Town Hall foyer to share findings and gather input on what future transit service should look like in Mount Pleasant. and Isle of Palms, as well as residents of Daniel Island, who can add their feedback at ridecarta.com/danielisland. Representatives from CARTA, TriCounty Link and the Berkeley-Charleston-Dorchester Council of Governments (BCDCOG) will be available to hear islanders ideas and answer questions regarding public transit, with a focus on what services are needed on Daniel Island. WHEN: Tuesday, June 17, 1-3 p.m.
WHY: As Charleston’s public transportation provider, CARTA always want to hear from residents. With this session, the authority hopes to gain insight on the public transit needs of Daniel Island residents and businesses.